Thank you for the wonderful review of my novel. I am glad you enjoyed it. Book two is progressing nicely. I’ll let you know when it comes out. 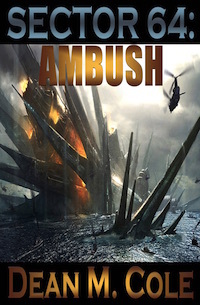 Sector 64: Ambush has a new cover. If you’d like to update your file, here’s a link to the new image. I can also email the file in any size you’d like. The link isn’t showing up, but e-mailing the file to cat2002116@yahoo.com is fine. About the size here would work.